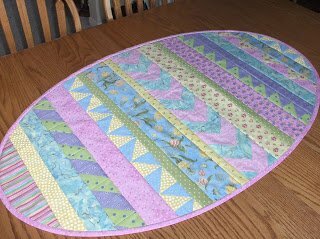 Create a finished table runner quickly and easily by quilting as you go. This technique uses a variety of piecing (you will learn how to use Thangles) and can create multiple shapes. An oval "egg" shape is shown. Requirements: Supplies for project; basic sewing kit; sewing machine.